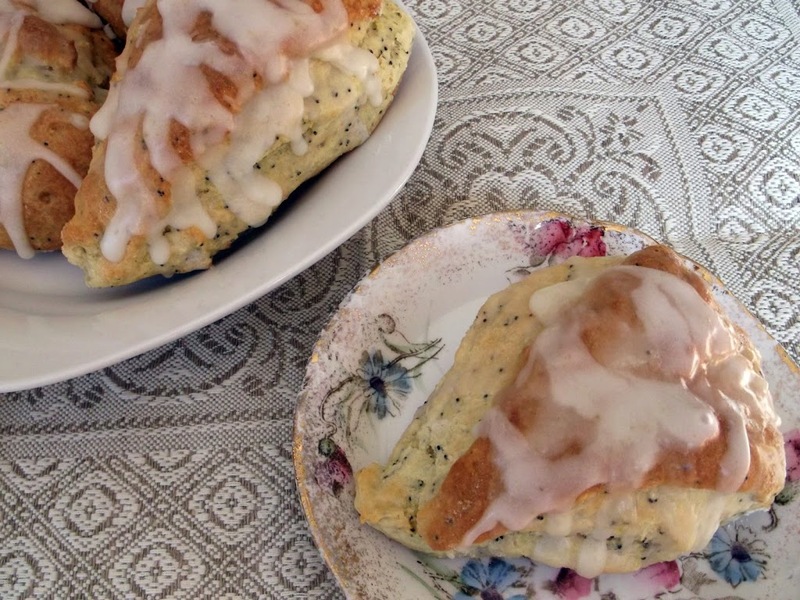 This week both Mike and our daughter Krista requested to have lemon poppy seed scones. 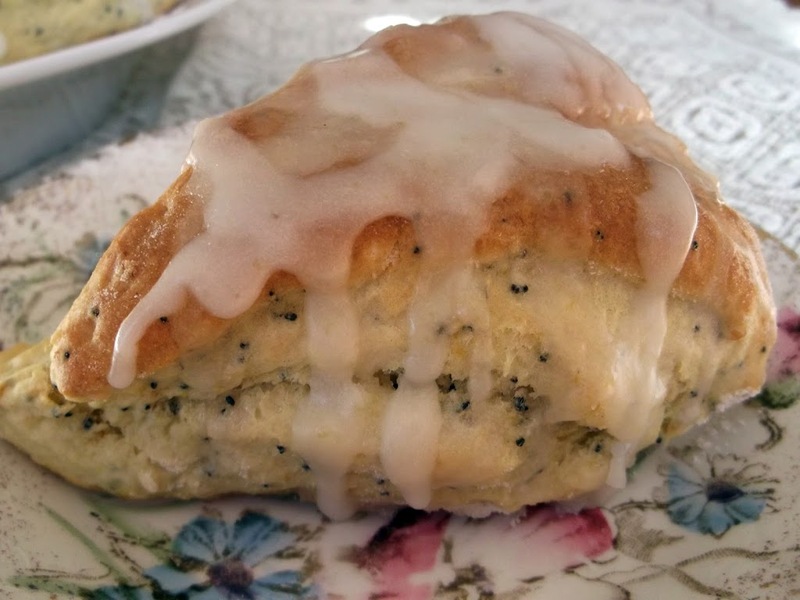 I have made lemon poppy seed bread before and everybody loves it so I knew that the scones would go over well also. When I looked for a recipe that sounded interesting I could not find one that I had all the ingredients for, so I decided to settle on one that came from cooks.com. I made some adjustments to the recipe so that it would fit more to what I had envisioned. I have to say these scones turned out quite well. I had added some lemon juice to the scones (the recipe did not call for any, it called just for lemon zest). Once the scones are baked you top them with a mixture of lemon juice and sugar for even more lemony flavor. Then for even more lemony flavor I made a thin lemon icing and drizzled that over top of the scones. 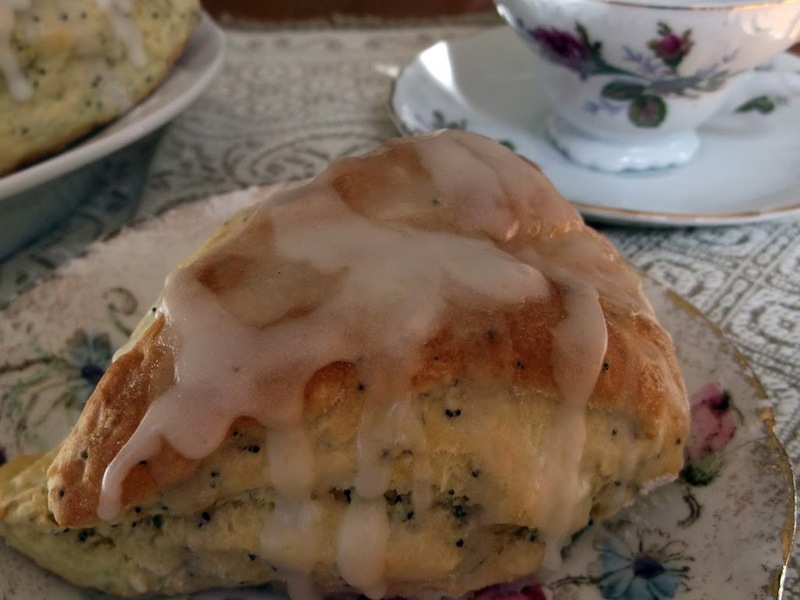 So if you like a lemony flavored scones, I would say this one is for you. Enjoy! Combine dry ingredients in large mixing bowl. Cut in butter with pastry blender or 2 knives until mixture resembles coarse crumbs. Beat buttermilk, egg, and lemon juice in small bowl. Pour onto dry ingredients; add poppy seeds and lemon peel. Mix with fork or by hand until well blended. On a lightly floured surface knead dough 5 or 6 times. Pat into into an 8 inch circle with floured hands. Cut into 8 wedges with long knife or a pizza cutter. Place on lightly greased cookie sheet. Bake at 400 degree F for 14 to 16 minutes until golden brown. Pour or brush topping over hot scones. Drizzle icing over cooled scones. Your scones look so thick and fluffy! And totally delicious! I’m craving them now. I think it’s going to be a scone weekend! Triple lemon scones! These look perfect! Thanks for this recipe and hope you have a wonderful week! These sound delicious. We love poppy seeds and lemon in this house! Thanks for stopping over.